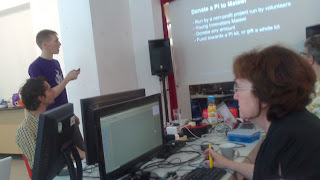 Yesterday I went to a Raspberry Jam - the pi world is full of tasty puns - at Madlab in Manchester. The jam is run by Ben Nuttall, a young entrepreneurial enthusiast who's also co-started a weekly email newsletter. (It's thanks to it that I know some of the stuff below) Here he is giving us an opening presentation on developments in the pi world. Some of what's going on is amazing. One man, fired by a stray remark about why barcodes on ready meals don't automatically tell the microwave how to cook your meal, has hacked his microwave to do just that. 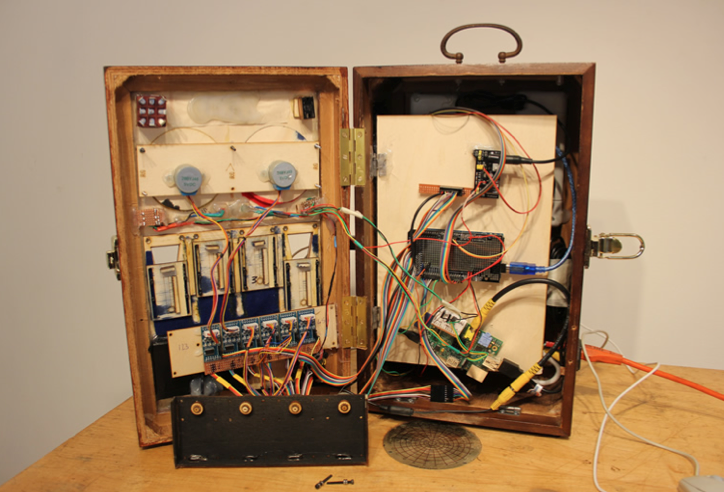 There are pi-powered web servers, a pet door triggered by a unique dog's bark, chess games and all sorts of educational projects. Linda, in the foreground of the picture above, and I spent the rest of the day trying to make lights go on, as instructed by our little Python-scripted programs on our pis. Her light was supposed to go on and stay on; mine was supposed to blink on and off. After a few patient, occasionally expletive-filled hours we succeeded, with a little help from our friends, newly-acquired among the 20 or so people who preferred to spend one of England's few hot summer days indoors hunched over little bits of disobedient equipment. I was heartened to meet a fellow-enthusiast who was an IT person by day and was making an Internet radio, as I'm hoping to do. And his very nearly works though it only gets BBC Radio 2. I am not sure I'll ever reach that dizziness-inducing target. The only shock of the day, after a hearty meal in the Earth cafe round the corner from the jam, was to get home and hear that my partner in life doesn't really want an Internet radio after all. That means I may have to come clean and admit I'm doing this for me, not for anyone else. 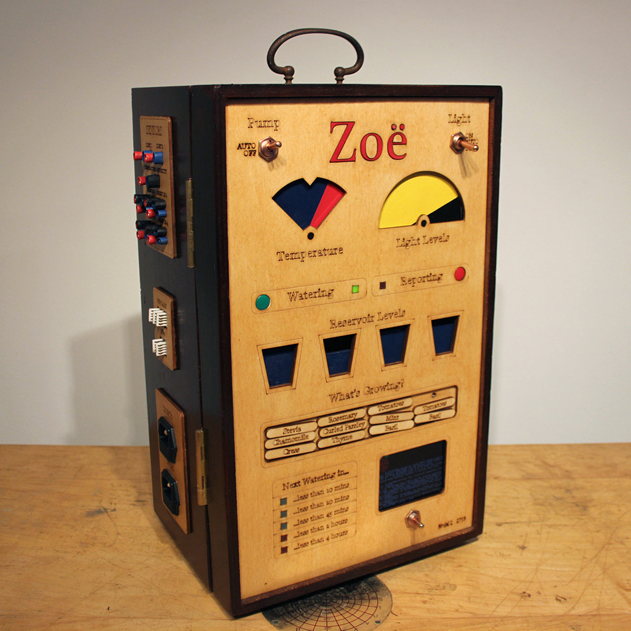 She'd prefer something that monitors and looks after her garden. Something, that is, like Zoe Star, a robot in a romantic relationship with her garden being created by Rachel Rayns, artist in residence at the Raspberry Pi Foundation. I may have to wait another lifetime to be skilled enough for that. Here are a couple of pictures of Zoe, from without and within. I have connected my pi to the home network - that happened yesterday - and today I realized a '0' should be a '1' and the network in turn connected me to the Internet. I thought this would be the easy part, not a week of hassle. I may rest on my laurels for a bit now while I try to remember what I had planned to do with the little scoundrel once it was up and running. One thought though. I do think the Web is a magical place. 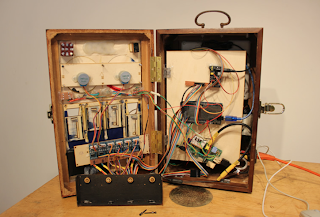 There's a vast library of documentation out there, from classic books to how-to-play-with-a-pi, at my fingertips. And there are many people who are Happy to Help, for no good reason other than the urge to be helpful, and the pleasure of seeing someone else get a little further along in something they're trying to do. I must remember that the next time I'm cursing the Virtual World for being full of intemperate thoughtless bullies and nincompooops. That's my raspberry pi, top right, and, foreground, its wifi dongle that so far doesn't work. All sorts of people think I'm technically-minded. People ask me technical questions and believe my answers. Yesterday I went for an awayday with a writers' group I've belonged to for years. They think I'm a techie. They worry about what would happen if I'm not there to voluntarily keep up the website. Little do they know how technically incompetent I am, that I can't even make a wifi dongle on a raspberry pi work. It seems to be a software problem. As far as the hardware goes, the little thing lights up, flashes, looks like it's busy communicating with somewhere. But it doesn't communicate with my router, and therefore, the rest of the world. I've scoured the internet for solutions, which are all written in variations on linux, the open-source operating system that runs raspberry pis. I don't know my way round linux and now I wish I did. My desperation is such, I've posted a question on two forums, confessing my ignorance but trying to sound a tiny bit more knowledgeable than I am, in the hope of help from patient nerds around the globe. Now I'm looking for something to fill in the time till Professor Someone answers. Maybe a game of online bridge. Or a call to my brother, who thinks I already have enough computery devices. Or a wistful song on the piano. Why did I decide to do this? I bought a raspberry pi. I thought it would be a harmless hobby for a semi-retired (they stopped buying my work) man of 64. Raspberry Pi is a tiny computer invented by Eben Upton and others to encourage computer science learning. I presume it's infuriating and delighting millions as I write. There's a charitable foundation and everything. For now I'm in an infuriated phase. I'm telling myself there's no hurry. Stay calm. 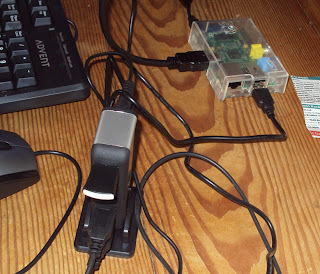 I have the pi itself, an sd card - pre-programmed with an operating system - that fits into the pi, a power cable, an hdmi cable to attach it to the bedroom telly, a powered usb hub because I read I might need one, a little dongle so I can go wireless, a cheap keyboard and an old laptop mouse that's held together with selotape. It took me two mornings of viewing youtube guides, reading handy little online manuals, and just fondling the components for a while (Health & Safety note: beware static electricity) before I had the nerve to try switching the initial arrangement on. Nothing happened. NO SIGNAL said the telly. Well, on the pi a red light came on next to PWR. Even I guessed what that stood for. A good sign. A green light next to the red light came on. Not so good. Googled 'raspberry pi red green light' and found the green light was supposed to flash if the card was doing anything. Staying lit meant it was doing nowt. I went off triumphantly to my local U3A meeting, failed to insinuate my new-found technical expertise into any passing conversations, and the next time I powered up, the day after - that was this morning - I resolved to make the wifi dongle work so I could really get to grips with things. This resolution has failed. That's why I'm wasting valuable raspberry pi time writing this blog, because I'm stuck.